The main page on The Economist. 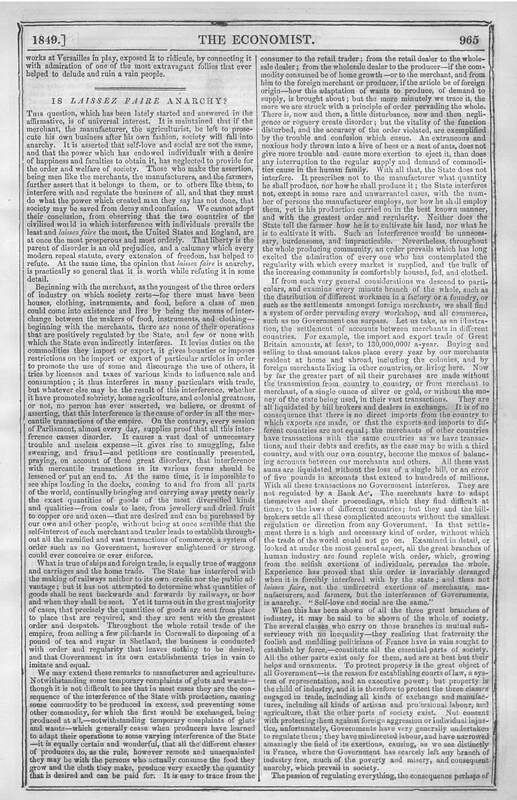 This article is unsigned but probably written by Thomas Hodgskin (1787-1869) [attributed to Thomas Hodgskin by George Smith, and I agree]. It appeared in The Economist, Saturday, September 1, 1849, vol. VII, No. 314, pp. 965-66. See a facsimile PDF version of this article [PDF 17.5 MB] or as JPEG [page 1] and [page 2]. Thomas Hodgskin (1787-1869) was an officer in the British Navy before leaving because of his opposition to the brutal treatment of sailors. He worked for the free trade magazine The Economist and wrote and lectured on laissez-faire economic ideas to working men’s institutes. 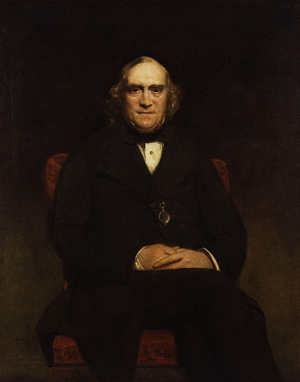 He was one of the earliest popularizers of economics for audiences of non-economists and gave lectures on free trade, the corn laws, and labor even before Jane Haldimand Marcet. Hodgskin passionately cared about the concerns of laborers after his experience with the maltreatment of sailors. His discussions of the labor theory of value followed up on David Ricardo and pre-dated John Stuart Mill’s expositions on similar themes. He was later cited by Karl Marx and Frederick Engels in Marx’s Capital. He is commonly, though incorrectly, referred to as a Ricardian socialist. This question, which has been lately started and answered in the affirmative, is of universal interest. It is maintained that if the merchant, the manufacturer, the agriculturist, be left to prosecute his own business after his own fashion, society will fall into anarchy. It is asserted that self-love and social are not the same, and that the power which has endowed individuals with a desire of happiness and faculties to obtain it, has neglected to provide for the order and welfare of society. Those who make the assertion, being men like the merchants, the manufacturers, and the farmers, further assert that it belongs to them, or to others like them, to interfere with and regulate the business of all, and that they must do what the power which created man they say has not done, that society may be saved from decay and confusion. We cannot adopt their conclusion, from observing that the two countries of the civilised world in which interference with individuals prevails the least and laissez faire the most, the United States and England, are at once the most prosperous and most orderly. That liberty is the parent of disorder is an old prejudice, and a calumny which every modern repeal statute, every extension of freedom, has helped to refute. At the same time, the opinion that laissez faire is anarchy, is practically so general that it is worth while refuting it in some detail. Beginning with the merchant, as the youngest of the three orders of industry on which society rests — for there must have been houses, clothing, instruments, and food, before a class of men could come into existence and live by being the means of interchange between the makers of food, instruments, and clothing — beginning with the merchants, there are none of their operations that are positively regulated by the State, and few or none with which the State even indirectly interferes. 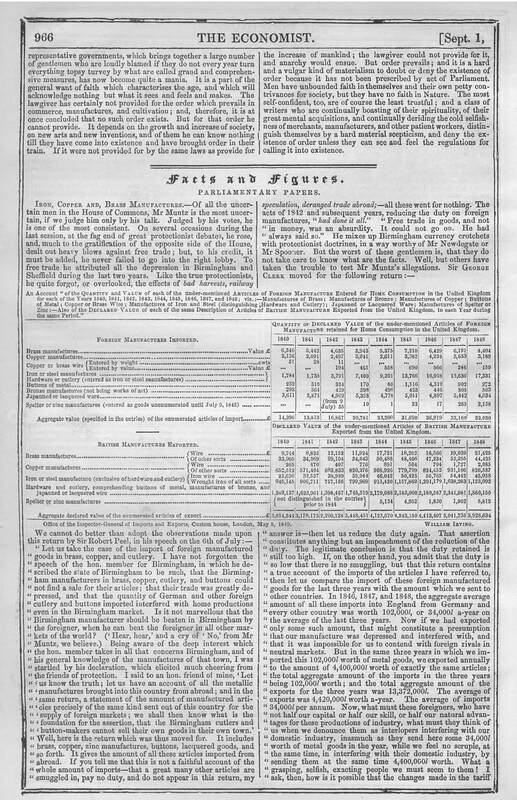 It levies duties on the commodities they import or export, it gives bounties or imposes restrictions on the import or export of particular articles in order to promote the use of some and discourage the use of others, it tries by licenses and taxes of various kinds to influence sale and consumption; it thus interferes in many particulars with trade, but whatever else may be the result of this interference, whether it have promoted sobriety, home agriculture, and colonial greatness, or not, no person has ever asserted, we believe, or dreamt of asserting, that this interference is the cause of order in all the mercantile transactions of the empire. On the contrary, every session of Parliament, almost every day, supplies proof that all this interference causes disorder. It causes a vast deal of unnecessary trouble and useless expense — it gives rise to smuggling, false swearing, and fraud — and petitions are continually presented, praying, on account of these great disorders, that interference with mercantile transactions in its various forms should be lessened or put an end to. At the same time, it is impossible to see ships loading in the docks, coming to and fro from all parts of the world, continually bringing and carrying away pretty nearly the exact quantities of goods of the most diversified kinds and qualities — from coals to lace, from jewellery and dried fruit to copper ore and oxen — that are desired and can be purchased by our own and other people, without being at once sensible that the self-interest of each merchant and trader leads to establish throughout all the ramified and vast transactions of commerce, a system of order such as no Government, however enlightened or strong, could ever conceive or ever enforce. What is true of ships and foreign trade, is equally true of waggons and carriages and the home trade. The State has interfered with the making of railways neither to its own credit nor the public advantage; but it has not attempted to determine what quantities of goods shall be sent backwards and forwards by railways, or how and when they shall be sent. Yet it turns out in the great majority of cases, that precisely the quantities of goods are sent from place to place that are required, and they are sent with the greatest order and despatch. Throughout the whole retail trade of the empire, from selling a few pilchards in Cornwall to disposing of a pound of tea and sugar in Shetland, the business is conducted with order and regularity that leaves nothing to be desired, and that Government in its own establishments tries in vain to imitate and equal. We may extend these remarks to manufactures and agriculture. Notwithstanding some temporary complaints of gluts and wants — though it is not difficult to see that in most cases they are the consequence of the interference of the State with production, causing some commodity to be produced in excess, and preventing some other commodity, for which the first would be exchanged, being produced at all, — notwithstanding temporary complaints of gluts and wants — which generally cease when producers have learned to adapt their operations to some varying interference of the State — it is equally certain and wonderful, that all the different classes of producers do, as the rule, however remote and unacquainted they may be with the persons who actually consume the food they grow and the cloth they make, produce very exactly the quantity that is desired and can be paid for. 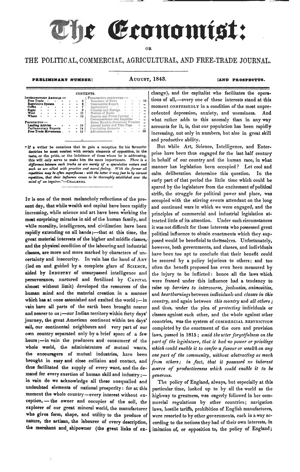 It is easy to trace from the consumer to the retail trader; from the retail dealer to the wholesale dealer; from the wholesale dealer to the producer — if the commodity consumed be of home growth — or to the merchant, and from him to the foreign merchant or producer, if the article be of foreign origin — how this adaptation of wants to produce, of demand to supply, is brought about; but the more minutely we trace it, the more we are struck with a principle of order pervading the whole. There is, now and then, a little disturbance, now and then negligence or roguery create disorder; but the vitality of the function disturbed, and the accuracy of the order violated, are exemplified by the trouble and confusion which ensue. An extraneous and noxious body thrown into a hive of bees or a nest of ants, does not give more trouble and cause more exertion to eject it, than does any interruption to the regular supply and demand of commodities cause in the human family. With all that, the State does not interfere. It prescribes not to the manufacturer what quantity he shall produce, nor how he shall produce it; the State interferes not, except in some rare and unwarranted cases, with the number of persons the manufacturer employs, nor bow he shall employ them, yet is his production carried on in the best known manner, and with the greatest order and regularity. Neither does the State tell the farmer how he is to cultivate his land, nor what he is to cultivate it with. Such an interference would be unnecessary, burdensome, and impracticable. Nevertheless, throughout the whole producing community, an order prevails which has long excited the admiration of every one who has contemplated the regularity with which every market is supplied, and the bulk of the increasing community is comfortably housed, fed, and clothed. If from such very general considerations we descend to particulars, and examine every minute branch of the whole, such as the distribution of different workmen in a factory or a foundry, or such as the settlements amongst foreign merchants, we shall find a system of order pervading every workshop, and all commerce, such as no Government can surpass. Let us take, as an illustration, the settlement of accounts between merchants in different countries. For example, the import and export trade of Great Britain amounts, at least, to 130,000,000l. a-year. Buying and selling to that amount takes place every year by our merchants resident at home and abroad, including the colonies, and by foreign merchants living in other countries, or living here. Now by far the greater part of all their purchases are made without the transmission from country to country, or from merchant to merchant, of a single ounce of silver or gold, or without the money of the state being used, in their vast transactions. They are all liquidated by bill brokers and dealers in exchange. It is of no consequence that there is no direct imports from the country to which exports are made, or that the exports and imports to different countries are not equal; the merchants of other countries have transactions with the same countries as we have transactions, and their debts and credits, as the case may be with a third country, and with our own country, become the means of balancing accounts between our merchants and others. All these vast sums are liquidated without the loss of a single bill, or an error of five pounds in accounts that extend to hundreds of millions. With all these transactions no Government interferes. They are not regulated by a Bank Act. The merchants have to adapt themselves and their proceedings, which they find difficult at times, to the laws of different countries; but they and the bill-brokers settle all these complicated accounts without the smallest regulation or direction from any Government. In that settlement there is a high and necessary kind of order, without which the trade of the world could not go on. Examined in detail, or looked at under the most general aspect, all the great branches of human industry are found replete with order, which, growing from the selfish exertions of individuals, pervades the whole. Experience has proved that this order is invariably deranged when it is forcibly interfered with by the state; and thus not laissez faire, not the undirected exertions of merchants, manufacturers, and farmers, but the interference of Governments, is anarchy. "Self-love and social are the same." When this has been shown of all the three great branches of industry, it may be said to be shown of the whole of society. The several classes who carry on those branches in mutual subserviency with no inequality — they realising that fraternity the foolish and meddling politicians of France have in vain sought to establish by force, — constitute all the essential parts of society. All the other parts exist only for them, and are at best but their helps and ornaments. To protect property is the great objet of all Government — is the reason for establishing courts of law, a system of representation, and an executive power; but property is the child of industry, and it is therefore to protect the three classes engaged in trade, including all kinds of exchange and manufactures, including all kinds of artisan and professional labour, and agriculture, that the other parts of society exist. Not content with protecting them against foreign aggression or individual injustice, unfortunately, Governments have very generally undertaken to regulate them; they have misdirected labour, and have narrowed amazingly the field of its exertions, causing, as we see distinctly in France, where the Government has scarcely left any branch of industry free, much of the poverty and misery, and consequent anarchy, which prevail in society. The passion of regulating everything, the consequence perhaps of  representative governments, which brings together a large number of gentlemen who are loudly blamed if they do not every year turn everything topsy turvey by what are called grand and comprehensive measures, has now become quite a mania. It is a part of the general want of faith which characterises the age, and which will acknowledge nothing but what it sees and feels and makes. The lawgiver has certainly not provided for the order which prevails in commerce, manufactures, and cultivation; and, therefore, it is at once concluded that no such order exists. But for that order he cannot provide. It depends on the growth and increase of society, on new arts and new inventions, and of them he can know nothing till they have come into existence and have brought order in their train. If it were not provided for by the same laws as provide for the increase of mankind; the lawgiver could not provide for it, and anarchy would ensue. But order prevails; and it is a hard and a vulgar kind of materialism to doubt or deny the existence of order because it has not been prescribed by act of Parliament. Men have unbounded faith in themselves and their own petty contrivances for society, but they have no faith in Nature. The most self-confident, too, are of course the least trustful; and a class of writers who are continually boasting of their spirituality, of their great mental acquisitions, and continually deriding the cold selfishness of merchants, manufacturers, and other patient workers, distinguish themselves by a hard material scepticism, and deny the existence of order unless they can see and feel the regulations for calling it into existence.